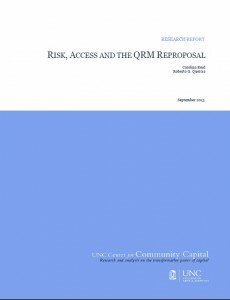 Financial institution regulators in August 2013 released a reproposal of the Credit Risk Retention Rule called for under the Dodd–Frank Wall Street Reform and Consumer Protection Act proposing to align the definition of the Qualified Residential Mortgage (QRM) with the Qualified Mortgage (QM) definition set forth under the Ability-to-Repay rule. Regulators originally proposed a narrower QRM definition that would require borrowers to make substantial down payments to qualify – potentially excluding many qualified borrowers from mortgage access. To understand the potential effects of the rule originally proposed, the UNC Center for Community Capital and Center for Responsible Lending undertook an analysis of a nationally representative group of 19.5 million loans originated from 2000 to 2008, including both prime and subprime loans (Quercia, Ding and Reid, 2012). The study, Balancing Risk & Access: Underwriting Standards and Qualified Residential Mortgages, found that applying the QM definition by itself to this broad universe of loans reduced the overall default rate5 by nearly half, to a 5.8 percent level. Additionally, our study found that further narrowing the QRM definition using various down payment and credit score cutoffs, while reducing the overall default rate somewhat further, also cut out a major share of the mortgages that performed successfully. Our findings generally showed that the basic QM definition achieved the optimal balance between reduced risk and access to credit. This finding supports the reproposed QRM definition. The reproposal references a report by U.S. Securities and Exchange Commission (SEC) economists who examined the impact of the various scenarios on a subset of loans in private label securities (White and Baugess, 2013). While the SEC study provides additional analysis on the potential effects of QRM, the numbers are significantly different from those in our paper. Because of the importance of QRM to establishing a strong mortgage market that works for a broad range of U.S. households, it is worth reviewing the similarities and differences between our two studies. For example, we both find that a restrictive QRM definition would exclude a large percentage of loans; indeed, the SEC report finds that less than 1 percent of the loans in their sample would qualify under the original proposed QRM definition. However, unlike our study which finds a default rate of just 5.8 percent for QM loans, they report a much higher 34 percent default rate among their defined pool of QM loans. This difference is due to two key factors. First, they include loans with risky features linked to default – including hybrid adjustable-rate mortgages (ARMs) and loans with prepayment penalties – as part of their QM sample, even though these features are actually restricted under QM. Second, the SEC study uses a very different and narrow sample of loans – only Private Label Security (PLS) mortgages originated primarily in 2004, 2005 and 2006, the height of the subprime crisis.7 Such mortgages are the worst of the worst, evidenced by the fact that the SEC sample has an overall default rate of 45 percent compared to an 11 percent overall default rate for our study sample. The results from such a narrow slice of bad mortgages should not be used to determine policy for the overall mortgage market. We maintain that analysis that considers the broader mortgage market is the best measure of the impact of the proposed rule(s) on access to credit and safety and soundness. The divisions between prime and subprime and between government-sponsored enterprise (GSE) loans and PLS loans that existed during the subprime boom are not likely to prevail into the uncertain future. With GSE reform still ahead, we should not rely solely on non-GSE market activity to make inferences about market activity post reform. When the broader pool of mortgages is considered, we find that QM effectively eliminates the worst performing mortgages and that stricter QRM guidelines provide only marginal benefits. In addition, our research highlights the importance of more explicitly considering access to credit in the QRM debate, particularly for lower-wealth borrowers and communities that historically have been undeserved by the mainstream credit market. Setting restrictive down payment requirements across the board will limit access to credit for a large percentage of U.S. households and have the largest impacts on communities of color. Homeownership and the housing finance system play a unique role in ensuring strong families, strengthening neighborhoods and boosting the overall economy. For this reason, it is critical to redesign the system to account for shifting demographics and changing consumer profiles and not exclude these families from the mainstream mortgage market going forward.